Our review of Volcan de Fuego - an organic, single-estate coffee from the volcanic soils of Guatemala. First off, many thanks to Hayden Horwood for sending us a bag of these wonderful coffee beans! They have an interesting story to tell. That’s reason enough to make us pay close attention, because - truth be told - many coffees struggle to boast much in the way of unique characteristics. Most coffees have origin stories to share that are notable more for their similarities than their differences. A little something to say about the micro-climate. A passing comment on a small difference in the soil. But this Volcan de Fuego coffee tells a very different and uniquely compelling story. First, these are Arabica Typica Anticuus coffee beans which were imported from Spain in 1885. From what I understand, these beans have been grown on this estate for over a hundred years without ever being altered genetically or hybridized with another seed. 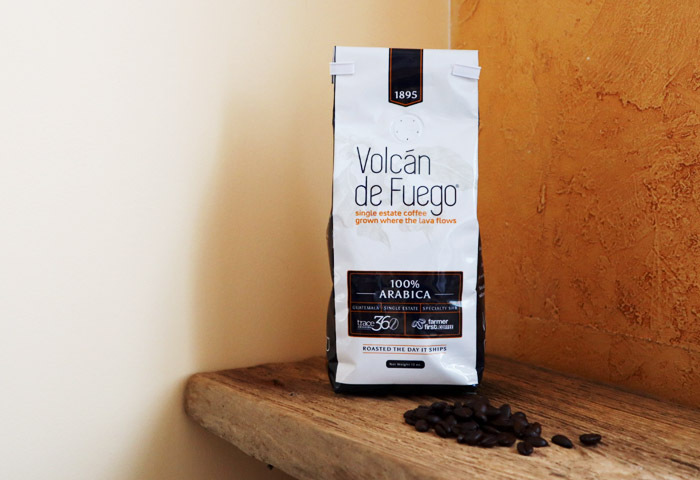 Second, Volcan de Fuego coffee is grown within an area of just 2 square miles, at an elevation of 7,000 feet, on the slopes of one of the world’s most active volcanoes. The soil in which it grows is known as Andisol soil. This kind of soil is unique to the slopes of volcanoes, comprised largely of volcanic ash and lava. I hope you’re getting the idea here. This is a coffee with a very different origin story! That’s all well and good, and interesting too. As always, we ground the beans immediately before brewing. And to make the coffee, we used our trusty Bonavita brewer. Then we left the coffee to cool for a couple of minutes before tasting. My wife took the lead, as she has a much more sensitive sense of smell. She immediately picked up on the fruity aroma. With maybe something floral in there too. When we tasted the coffee, we both smiled. This is our kind of coffee. It’s a personal preference, but we do like a coffee that is full-bodied and announces itself with a touch of bitterness on the tongue. In other words, it’s a robust cup of coffee. That said, that robust presence in the mouth doesn’t overwhelm its more subtle flavors. There’s a solid layer of chocolate in there, which also earns this coffee some bonus points from us. Again, a personal preference. And then you get a layer of the fruity and floral flavors we picked up in the aroma. A touch of citrus too. In short, we love this coffee. It’s not hard to find a strong, full-bodied coffee. And it’s easy to find more delicate brews that deliver on those fruit and floral notes. What’s much harder to find is a coffee that delivers it all, in once balances package. So yes, we’re fans. We love this coffee. You can learn more, and order some for yourself, at the Volcan de Fuego website.